Want to start playing with sensors, but don't know where to begin? This kit includes a variety of basic sensors for any beginner or experienced programmer. 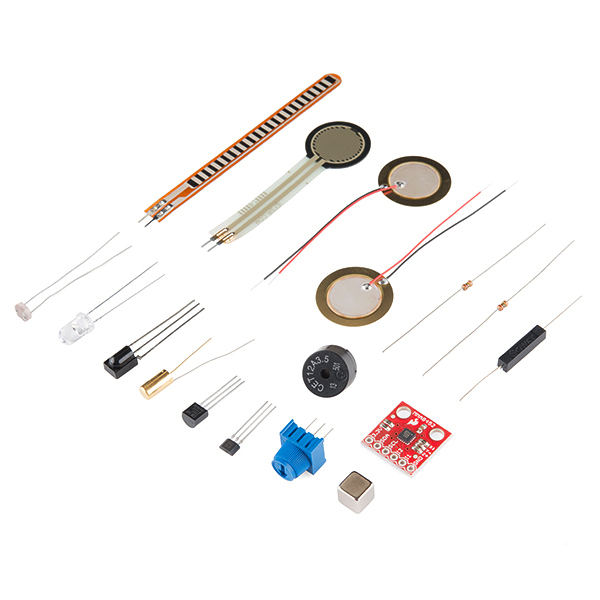 With everything included in this kit, you'll be able to sense acceleration, force, vibration, Infrared light, ambient light, temperature, and more! These are some great basic sensors from varying categories. Hall Effect Sensor - Holding a magnet near this sensor will cause the output pin to toggle. This makes for a robust presence sensor. Tilt Sensor - A simple AT407 basic tilt switch that can easily be used to detect orientation on your project. Piezo Element - These two Piezo elements come in handy when you need to detect vibration or a knock. You can use these for tap or knock sensors pretty easily by reading the voltage on the output. Insulated Reed Switch - Senses magnetic fields, makes for a great non-contact switch. IR Receiver Diode - The TSOP382 is a miniaturized receiver for infrared remote control systems. Infrared LED - This is a very simple, clear infrared LED. These devices operate between 940-950nm and work well for generic IR systems. TMP36 - Temperature Sensor - The TMP36 is a low voltage, precision centigrade temperature sensor. It provides a voltage output that is linearly proportional to the Celsius temperature. Trimpot 10K with Knob - This 10K trimmable potentiometer has a small knob built right in and it's breadboard friendly to boot! Piezo Buzzer/Speaker - This is a small 12mm round speaker that operates around the audible 2kHz range. You can use these speakers to create simple music or user interfaces. My son is enjoying it! It seemed funny that the kit only comes with the pieces and not even a name/description of each sensor, but I was able to print that off from the website, and then also find a description & picture of each sensor by clicking on the "Parts Wishlist" link from the product web page. I like that there are also tutorials on the website for how to install each one. So we are happy with the purchase, and my son is enjoying trying them out. Im happy with all my products, i will order from you guys, everything was in a perfect condition i will recommend you with all my geek friends.